In one my previous posts I looked at the stock market valuations in the US to conclude that they were in line with recent historical data. In fact the stock market looked cheap relative to most years since the mid 1980s. But that was before the US election! Since the election the stock market has gone up and interest rates have gone up as well. How do stock market valuations look like today? 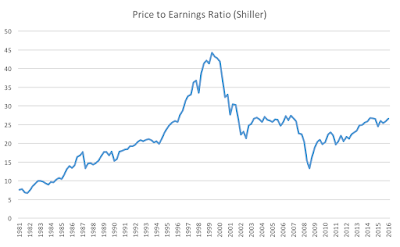 I follow the same methodology of the previous post and start with the Price-Earnings ratio constructed by Robert Shiller. We know that this P/E ratio has been high relative to historical averages (today it stands above 28, a level only achieved before in the 2000 bubble or in 1929. But the P/E ratio depends on several macroeconomic variables, in particular the level of real interest rates. In my previous post I made the argument that once we correct for the level of the real interest rate the current P/E ratio looks reasonable. And let's express the risk-adjusted discount rate as the sum of a risk-free rate (RF) and a risk premium (RP). This expression says that the E/P ratio is a function of three factors. Each of them can make the ratio low (i.e. stock prices high relative to earnings): either real interest rates are low, or investors expect earnings to grow fast or they feel good about risk and they are willing to accept a low risk premium. Measuring the real risk free rate using 10-year interest rates and inflation expectations from forecasts of inflation from the survey of professional forecasters posted at the Philadelphia Fed we can get the updated picture below. We can see that after the election the index has increased both because of higher stock prices and also higher interest rate. 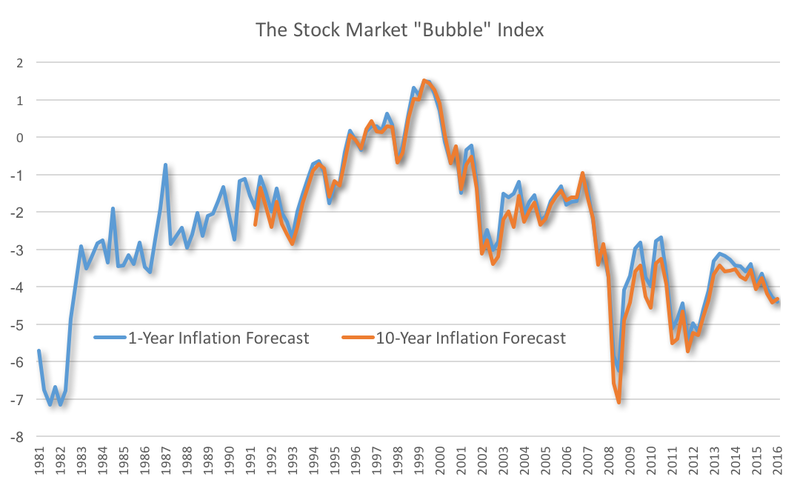 The stock market is more "bubbly" than back in October but still in line with historical estimates. One issue that might be relevant for this chart is that we have been downgrading expectations of potential growth over all these years. How much would our assessment change if we took this into account? This number tells us the implicit compensation that markets expect for risk given current E/P ratios, real interest rates and assuming markets share the views of the CBO about future growth rates (and that earnings grow at similar rates as GDP). Below are the results of such calculation. What we can see in this chart is that today the risk premium remains in line with historical estimates although it has come down after the election, as expected. The risk premium reached a very low level at the end of the 1990s when we combined extremely high P/E ratios (above 40) with fairly high real interest rates. This is strong sign of a bubble because either markets overestimated growth (relative to CBO forecasts) or underpriced risk. The risk premium was extremely high during the 2008-09 crisis when P/E ratios were extremely low and interest rates had come down very fast, but those were times of very high uncertainty. In the last coupe of years the risk premium has been around 6%. While stock prices climbed, interest rate fell and kept the risk premium stable. How much growth will increase remains a source of debate. While some believe that potential expansionary fiscal policy might boost growth, it is still unclear how much of it will be implemented and the actual policies that will be adopted might not be as growth friendly as markets believe. Given what we know so far I remain skeptical about the potential for acceleration of growth rates in the coming years. Earnings could grow faster than GDP growth with policies that are friendly to companies but as the labor market becomes tighter it is not obvious how large this effect can be. And this takes us to the last issue: risk. Clearly investors are not pricing much risk in the stock market, quite the contrary. This is a surprise. Regardless of what you believe about Trump's stated policies, he has provided very few details on what his actual policies will look like, he has contradicted himself in numerous times and some of his statements open the door for very damaging events from a political and economic point of view that could lead to a global economic slowdown or a recession (not to mention other, more catastrophic, events). The market is clearly not pricing any of this risk. I find this puzzling. 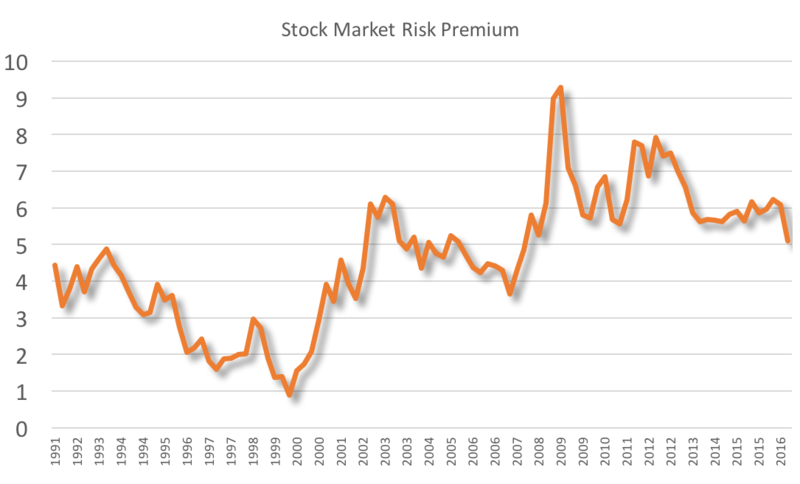 We are still 1% point from the risk premium at the 2007 peak and very far from the 2000 craziness so there might still be some room to go. But let's remember that those are the years that preceded a significant fall in the stock market, not the right benchmark to use. The OECD just published its November 2016 Global Economic Outlook. Their projections suggest an acceleration of global growth rates in particular in countries with plans for a fiscal expansion. In the case of the US, and based on the "plans" of the Trump administration, the OECD projects an acceleration of GDP growth to 3% in 2018. I am very glad to see that the OECD is more open to the idea that a fiscal expansion might be the right policy choice in a low growth environment. I am also very happy that they are ready to admit that fiscal policy multipliers are larger than what they previously thought. But I am puzzled that they seem to ignore their previous disastrous economic policy advice. And I am even more puzzled that they are upgrading their estimates of fiscal policy multipliers (in particular for tax cuts) at the wrong time in the business cycle, when the economy must be closer to full employment. Here is the history: back in 2011 many advanced economies switched to contractionary fiscal policy at a time where their growth rates were low and unemployment rates remained very high. During those years the OECD seemed be ok with fiscal consolidation given the high government debt levels (consolidation was necessary). They understood that there were some negative effects on demand but as they assumed multipliers or about 0.5 (in the middle of a crisis with very high unemployment rates!) the cost did not seem that high. Today, in an economy with unemployment rate below 5%, and wages and inflation slowly returning to normal vales and a central bank ready to raise interest rate, the OECD turns around and decides to change the fiscal policy multipliers to something close to 1 even if the announced fiscal measures consists mostly of tax cuts to the wealthier households with low propensity to consume. This is what I would call a procyclical revision of fiscal policy multipliers. Encourage consolidations in the middle of a crisis and expansion in good times. Not quite what optimal fiscal policy should look like. And, of course, the media (including the Financial Times) reported on the OECD study as a validation of the new US administration policies. And I leave for another (longer) post the absence of any serious discussion of the risks associated to a Trump presidency. This is coming from an organization that has been obsessed with the risks of inflation and excessive asset appreciation during the crisis. How expensive is the US stock market? Have the strong gains since the financial crisis of 2008 built yet another massive bubble that will require a correction? 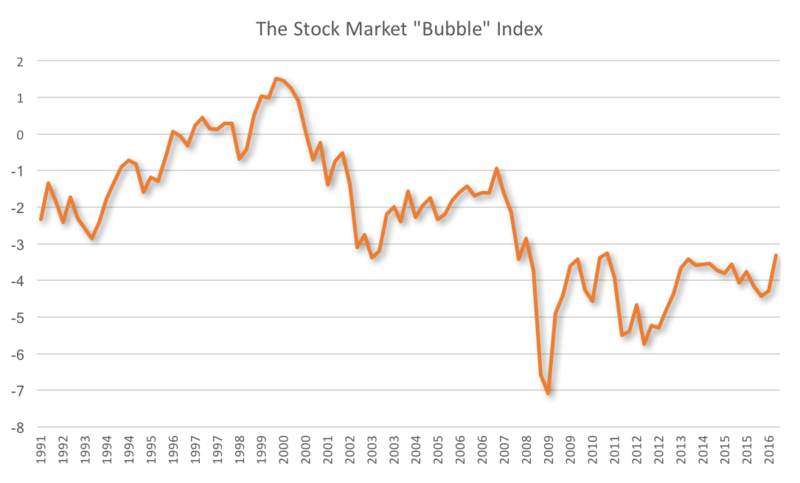 Some investors fear that recent stock market record levels are a sign that this is the biggest bubble ever. Of course, such a simplistic comparison of stock prices is flawed both because stock prices are nominal and therefore likely to go up over time and also because they are driven by (real) earnings which are also likely to increase as (real) GDP increases. To correct for these trends we can do a simple adjustment and look instead at the price-to-earnings ratio. I will use here the one constructed by Robert Shiller (although some ague that recently the index could be less informative because of the way earnings are being calculated). The P/E ratio shows that the end of the 90s bubble was by far the period were stocks looked the most expensive relative to earnings. What do P/E ratios look like today? On the expensive side. With a ratio above 26 it stands right at the level before the 2008 crisis and a lot higher than previous similar historical episodes. Most tend to compare it to 16, as the average P/E ratio in recent decades, to signal that the stock market is very expensive. Without going back many decades, we could say that the stock market today looks as expensive as it has been since 1981 with the exception of the bubble of the late 90s. But that cannot be the end of the analysis as we know that the P/E ratio depends on several macroeconomic variables, in particular the level of real interest rates. And we know that real interest rates are at very low levels today and likely to say low for a long period of time. How does the above analysis change if we adjust for changes in the interest rate? What this equation says is that the stock market is going to look expensive when the risk free rate looks high relative to the earnings-to-price ratio, given that the only way to justify such high stock prices is through expectations of high growth or perception of unusually low risk. What does this index look like? 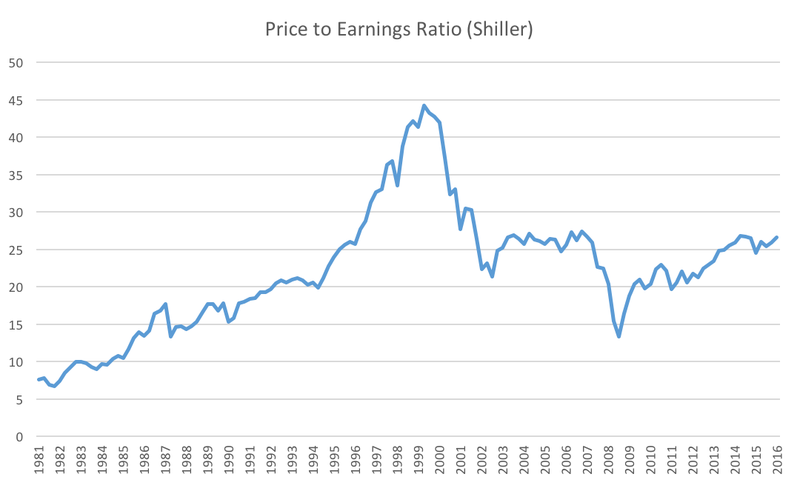 I constructed the difference between RF - E/P by using price-to-earnings ratio and 10 year nominal interest rate from Shiller. And I converted nominal into real interest rates using forecasts of inflation from the survey of professional forecasters posted at the Philadelphia Fed (I mostly use 10-year inflation forecasts that match the duration of the nominal interest rate. 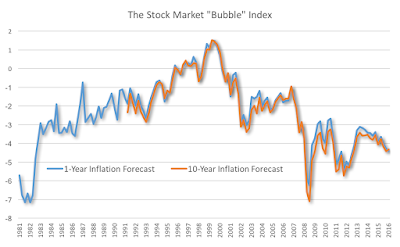 But for the earlier years only the 1-year inflation forecast is available to I have decided to plot both series, which looks almost identical). This chart tells a very different story from the unadjusted P/E ratio. The 90s bubble is still there, as you would expect because interest rates were high. This means that the very high stock prices during those years could only be justified by very optimistic views on growth or perceptions of unusually low risk. Both were present and they turned out to be wrong, that's what a bubble looks like. We can also see that the financial crisis of 2008 sent stock prices close to the lowest levels, similar to what happened during the double recession of the early 80s. Since then stock prices have recovered but they remain low relative to any of the previous years. Even if we ignore the 90s as an aberration, compared to the expansion of the 80s or the 2000s, the stock market today remains "cheap". And by cheap we mean that to justify current prices we do not need a very optimistic view on growth or that investors are demanding a very high risk premium. In other words, the stock market tells us that either investors are pessimistic about growth or very risk averse (which is the opposite of what you expect to see during a typical bubble). Does this mean that the stock market is undervalued? No, it all depends on whether our current growth expectations or risk assessment are correct. Growth might surprise us and be even lower than what we think today, risk could be a lot higher, maybe 10 year interest rates are a really low indicator of what interest rates are going to look like in the next 10 years. In all these scenarios the stock market will look more expensive than what it looks today. But growth could also surprise us through gains in productivity. And it might be that some of the current risks do not look that likely a few years from now. And then the stock market will look really cheap. That's the uncertainty that we always have when trying to assess the pricing of the stock market. A note on real growth expectations: our view on growth has clearly been revised downwards because of unfavorable changes in demographics and productivity. It is possible that future real GDP growth today is 1% below what it was in the 80s or the 2000s. But even if we were to make that correction to our index, the stock market would not look expensive. If you look carefully at today's index the number is about 1.5% lower than in the 80s and about 2-3% lower than in the 2000s. These differences are larger than revisions to potential GDP growth rates. In summary, unlike the strong warning signals we get when looking at record-level nominal stock prices or even at the P/E ratio, a simple adjustment of P/E ratios by current levels of interest rates paints a very different picture of the stock market. Adjusted for current levels of real interest rates, P/E ratios tell us that the stock market today is on the cheap side relative to previous similar phases of the business cycle. You can lower interest rates but can you raise inflation? Last week the Bank of England lowered their interest rates. This combined with previous moves by the ECB and the Bank of Japan and the reduced probability that the US Federal Reserve will increase rates soon is a reminder that any normalization of interest rates towards positive territory among advanced economies will have to wait a few more months, or years (or decades?). The message from the Bank of England, which is not far from recent messages by the Bank of Japan or the ECB is that they could cut interest rates again if needed (or be more aggressive with QE purchases). Long-term interest rates across the world decreased even further. 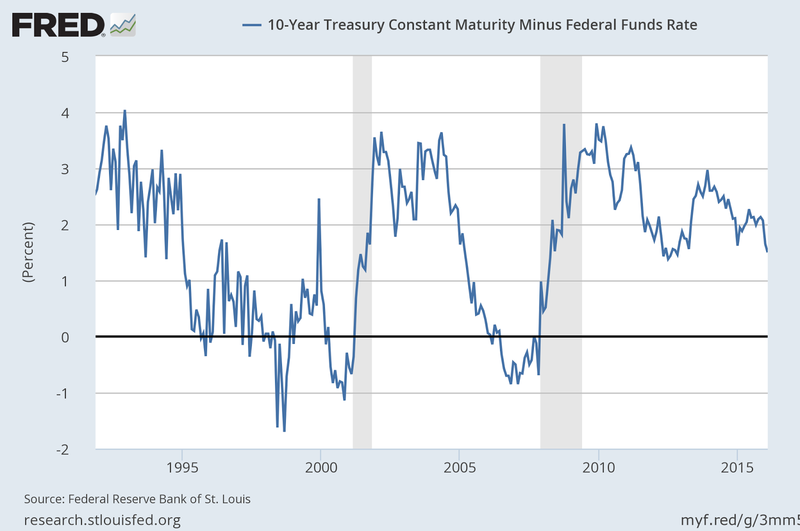 The current levels of long-term interest rates have made the yield curve extremely flat. And in several countries (e.g. Switzerland) interest rates at all horizons are falling into negative territory. The fact that long term interest rates is typically seen as the outcome of large purchases of assets by central banks around the world. In fact, many see it as a success of monetary policy actions. But if monetary policy is being successful we expect inflation expectations and growth expectations to increase. Both of these forces should push long-term interest rates higher not lower! Something is fundamentally not working when it comes to monetary policy and it is either the outcome of some forces that the central banks are unable to counteract or the fact that central banks are not getting their actions and communications right. On the communications I will repeat the argument I made earlier: When central banks repeat over and over again that they can lower interest rates even more they are misleading some to believe that lower interest rates (long-term and short-term, real and nominal) are a measure of success of monetary policy. This is not right. Lower nominal interest rates across all maturities cannot be an objective when inflation and growth are seen as too low. Success must mean higher nominal interest rates. 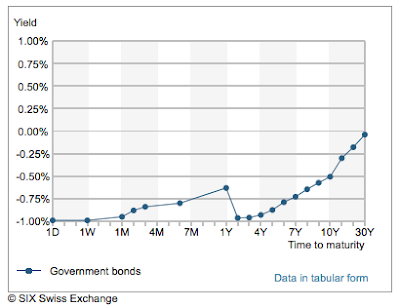 And success must mean at some point a steeper yield curve not a flatter one. 1. They want to send a message that they are both powerful and not out of ammunition. Repeat with me: "Interest rates are low and they can get even lower." 2. These are interesting times. 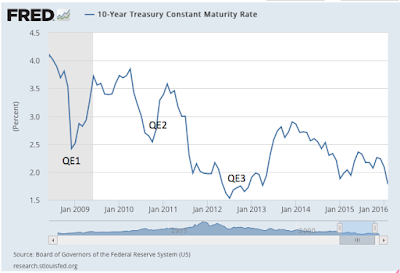 With short terms rates stuck around zero, all the action of the yield curve has to come from long-term rates and, in addition, QE and the massive purchase of assets is also a new phenomenon that is not always well understood by market participants. My guess is that it is this combination of circumstances that are unusual by historical standards and the difficulty of communicating a complex monetary policy strategy by central banks that are sending long-term interest rates to even lower levels. These levels are not consistent with any reasonable scenario for growth or interest rates over the next decades. When 30 or even 50 year interest rates are negative or close to zero something is not right. Either this is the end of growth as we know it or the start of a 30-year period of extremely low inflation combined with deflation or our expectations are seriously off and we are up for an interesting surprise. "Representative democracy is based not only on universal suffrage, but also on reason. Ideally, deliberations and votes result in rational decisions that use the current state of knowledge to deliver policies that advance citizens’ wellbeing." Very well said. He also brings up the point that the lack of influence of economic experts is not that different from that of other experts (as illustrated by the debates on climate science, GMOs,...). I share that view and my guess is that the mistrust of economic experts is simply more visible because of their influence (or lack of) in the political debates that tend to be a lot more present in the media than the debates on scientific issues. How to enhance the trust on experts? Not obvious, according to Pisani-Ferry. What is needed is a combination of of discipline among the community of experts, an education system that equips citizens with the tools to distinguish between facts and fiction and the development of better venues for dialogue and informed debate. Good luck! Unfortunately we are very far from this ideal scenario. Education has reached more citizens than ever, more so in advanced economies, but we see little difference. It might be that the complexity of the issues that are being debated is at a level which still does not allow us to have an informed discussion based on facts and not ideology. Opinions that are expressed using either the wrong facts or no facts at all somehow are able to reach the public and have an influence that is as large as that of those who present the facts. And the media does not serve at all as a filter, maybe because controversy sells or maybe because there is a need to present a 'balanced' view of the debate or simply because of self-interest. Here is my example of the day that illustrates this point: the Financial Times published two articles yesterday on the merits of quantitative easing. One argued for more QE under the logic that is working and we just need to increase the dosage. The second one presented the view that quantitative easing (as well as expansionary fiscal policy) are the wrong tools to use to generate a recovery and that they are likely to lead to a very unhappy ending. If you read the second article you will notice the use of dubious facts and an economic logic that anyone who has ever taken any economics course should realize that is badly flawed. "If the average interest rate is 2 per cent, then a 300 per cent debt-to-GDP ratio means that the economy needs to grow at a nominal rate of 6 per cent to cover interest." The increase in debt in the world is matched by an increase in assets. The interest rate paid by borrowers goes to lenders. So the world (or a given country) does not need to find income to pay for this interest, this is a transfer from borrowers to lenders. Borrowers need to pay for the interest but if debt is coming from a mortgage to buy a house, I do not need to pay rent anymore. Looking at interest payments alone (or at liabilities without taking into account assets) is just wrong. The 300% number cannot be associated to a country or a government, most debt is internal. No country has an external debt that is anywhere close to that level. Same is true for governments (with the exception of Japan which is not far, but, once again, most of this debt is internal - so the interest that the government of Japan has to pay goes to the Japanese citizens who happen to be the taxpayers). Even if you had a government that had 300% of debt, the calculation above is simply wrong. If interest rates are 2%, you need to grow at 2% (not 6%) to ensure that the debt-to-GDP ratio stays constant (as long as your additional borrowing or saving is zero, of course). This is something that is taught in a principle of economics course. The authors are confusing the value of interest payments and the required growth to make that level of debt sustainable. The rest of the article contains many other mistakes. It is embarrassing that the Financial Times is willing to publish such a low quality article. Will this article influence anyone's view on the debate on monetary policy? I do not know but what I know is that the pessimistic view presented in the article on the role that monetary and fiscal policy is popular enough that is still influencing both the debate around and also the outcome of current economic policies. So we are very far from having informed and factual debates about the economic (and scientific) issues that shape economic and social outcomes. As an economist I continue to do my best by sharing my views and analysis with a wide audience through blog posts like this one but it is depressing to see how those that rely on flawed analysis often manage to reach the public through the validation of the most respected media. The deceleration of China's GDP growth rate has been seen both as a natural transition towards more sustainable growth rates and a sign that the Chinese model of growth is coming to an end. How does this deceleration of growth rates compared to similar historical episodes for other countries? Is 6-7% a sustainable growth rate for China? Start with an example that nicely validates the theory: South Korea. 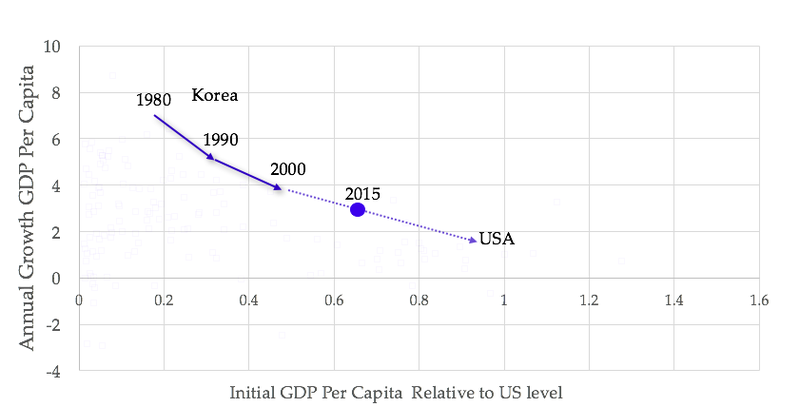 Let's plot the level of GDP per capita of South Korea relative to the US at the beginning of each of the last three decades and then compare it to the growth rate of GDP per capita during the years that followed [I will treat the 2000-2014 period as the "decade of the 2000s"]. 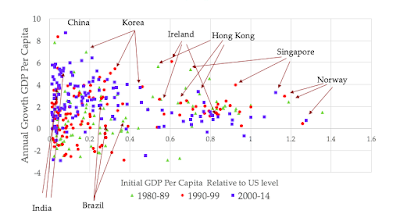 The plot above (click on it for a larger picture) shows that South Korea starts in 1980 with a level of GDP per capita below 20% of the US leading to annual growth during the 1980-90 period of about 7%). This allows the country to reach a level of 30% relative to the US by 1990. At that point growth is decelerating and during the next 10 years it goes below 5.5%. The transition continues with decelerating growth during the next decade (around 4%). Today South Korea has a GDP per capita of about 65% of the US level and it is likely that over the coming years we will see a further slowing down of its growth rate as it continues its convergence towards the US. So far so good for our theory. How about China? In 1980 China starts at a much lower level of GDP per capita and, consistently with our logic, a very fast growth rate of about 7%. But as the country converges towards the US growth rates accelerate to above 8% during the 90s. 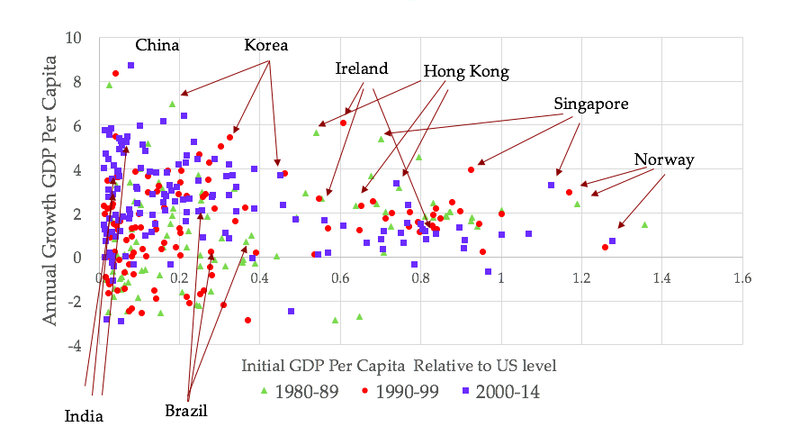 One potential explanation for this acceleration is that China was moving towards a more natural growth rate given how low its GDP per capita was relative to, say, South Korea. But the next decade (2000-2014) will bring yet one more increase in growth rates towards 9%. At that point the growth rate looks spectacular compared to the case of South Korea. To put it in perspective, by 2015 China has reached a level of 25% of US GDP per capita (the vertical red line) and when South Korea had reached that level it was already growing at less than 6%. The comparison to South Korea makes clear that growth rates of 8-9% in China given its current development would have looked like a true miracle. What if South Korea is used to benchmark future Chinese growth rates? Given the current GDP per capita of China, we are looking at a growth rate of slightly below 6% over the next decade. And a growth rate that will decelerate further as time passes. This number is slightly lower than the current target of the Chinese government, but not far given that we are talking about 10 years in a path that is likely to be one of decelerating growth rates. [Note that the growth rates above are in per capita terms. Working age population is currently not growing much in China so the GDP figures should not be too different]. Final question: is South Korea a good benchmark for China? Let's look at other potential fast-growing economies during the same years. 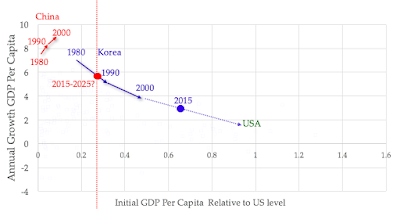 South Korea is clearly the best performer in the range of countries that are below 50% of the US GDP per capita (and, yes, there are plenty of failures!). So using South Korea as a benchmark is providing a very optimistic case on Chinese growth. There are a few other countries that look like outliers (from above) in this relationship but it is unclear that they are relevant examples for China. Hong Kong and Singapore are small city states. Ireland in the 90s is a very unique decade for a European country, and oil producing countries (such as Norway) have dynamics that cannot be replicated without that level of natural resources. In summary, the deceleration of GDP growth rate in China seems like a natural evolution of the economy as it follows its convergence path. Growth rates around 6% still put China as the best performer among all countries in the world, conditional on its level of GDP per capita. There are plenty of other countries in the world that show China what low growth rates of GDP really look like. And they might be an example of what could happen to the country if it cannot keep its policies and institutions among the best in class for its current level of development. The asymmetry of inflation or the ECB? From this Financial Times article: In yesterday's press conference Mario Draghi was asked about the possibility of changing the ECB's inflation target. His answer is very revealing about the extreme asymmetric nature of monetary policy these days (or at least that's how the ECB sees it). Draghi admits that the ECB is having a very difficult time reaching its target and he is now hoping this will happen by 2018. He rules out the idea of lowering the inflation target (to make reaching the target easier) because this would lead to lower inflation expectations and higher real interest rates. So what about raising the inflation target to avoid falling into the zero lower bound again (and possibly to show a stronger commitment to higher inflation)? According to Draghi it would make no sense because if they cannot reach a 2% target why would you set a higher target that you cannot reach by an even larger margin. Mario Draghi forgets that the ECB target is asymmetric in nature. The target is below (but close) to 2%. That's a signal that falling below the target is ok while being above is unacceptable. Maybe this asymmetry is partly to blame for the difficulty of reaching 2%. In his speech he clearly states that lowering inflation is always easy but that raising inflation because of the zero lower bound is much harder. But this sounds to me like a very strong argument in favor of higher targets. The fact that he does not see it that way tells us that the ECB is really averse to higher inflation. The idea that the same asymmetry is present when it comes to inflation expectations might be realistic but, in my view, it sounds too pessimistic. It might be true that raising inflation is hard but not impossible. Setting a higher target should move inflation expectations in the right direction and help reach that target. The fact that he does not see it that way is, once again, a reflection of the asymmetric view of the ECB about inflation. So maybe the asymmetry that he sees is not completely independent of the asymmetric view that the ECB and its officials clearly express every time they talk about the subject. Interesting times for monetary policy and a reminder that we need to change the way we teach monetary policy to our students. Olivier Blanchard has some interesting suggestions for how to modify the next edition of his textbook after what we have witnessed in the crisis but I think that he might be falling short on the changes we need to explain central bank policies and their outcomes. How informative is the slope of the Yield Curve? The yield curve is becoming flatter. The difference between the 10-year and 2-year government bond is now approaching 1%. The yield curve tends to get flatter when the economy reaches the end of an expansion phase and it is many times seen as a predictor of future recessions. But interest rates are not what they used to be. If short-term interest rates are stuck at zero, all the movements in the yield have to come from long-term interest rates. This is the opposite than what we have seen in previous cycles where all the action has come from short term rates. The 2-year rate is not quite zero and has been moving recently, so an interesting question is whether the yield curve is once again driven by movements in short-term rates. Not quite. 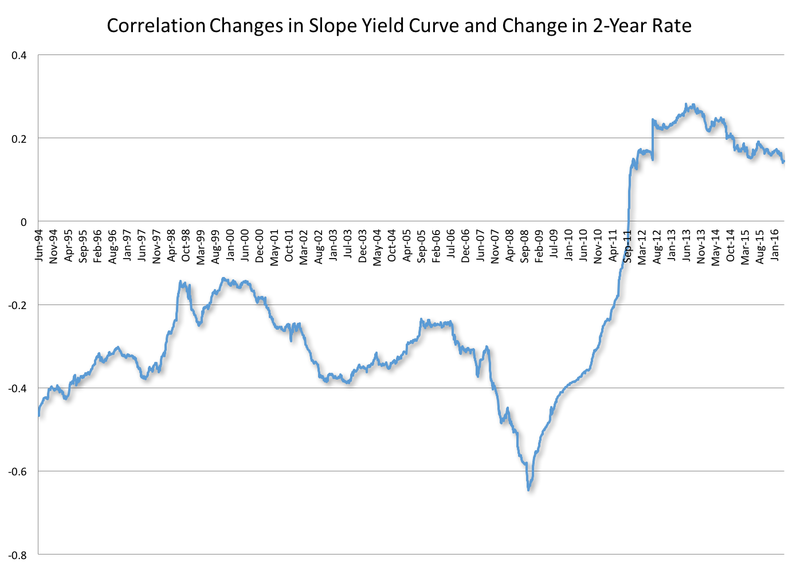 Let's calculate the correlation between changes in the slope of the yield curve (measured as 10 year minus 2 year rates) and the changes in the 2 year rate. The correlation [calculated over a 3 year window] is plotted below. If the 10 year rate did not move and all the action was coming from the 2 year rate this correlation would be -1. 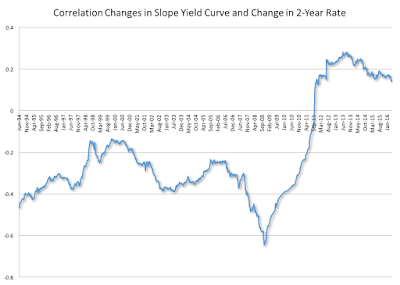 Prior to 2011 this correlation was always negative and in some cases as high as -0.6 signaling the importance of changes in short-term rates as drivers of changes in the slope of the yield curve. But as of the summer of 2011 this correlation has turned positive indicating the importance of movements in the long-term rates and the way they are correlated with the 2-year rate. As an illustration: an event that causes both short-term and long-term rates to move down but where the 10 year rate falls by more would lead to a positive correlation between changes in short-term rates and changes in the slope of the yield curve. So we are living in a new world where change in the slope of the yield curve are driven by a combination of changes in both short-term and long-term rates that are not easily mapped into previous cycles. Where the yield curve goes from here is an open question. A strong recovery and an increase in inflation expectations could result in an increase in its slope and possibly the return towards more normal times. A negative event could potentially lead to a further flattening of the yield curve and one more step towards Japanification of the US economy. World growth: mediocre or pathetic? The recent disappointing performance of the world economy has been labelled as the "new mediocre" by Christine Lagarde, the "new reality" by Olivier Blanchard and the "new normal" by many others. How mediocre is global growth? The answer to this question heavily depends on the way we measure world GDP. Aggregating national GDPs can be done in two ways: using market exchange rates or using PPP (purchasing power parity). Because PPP puts larger weights on emerging markets and because these countries have shown faster growth rates in recent decades, the two measures have been diverging over time and now they offer a very different picture of the state of the world economy. 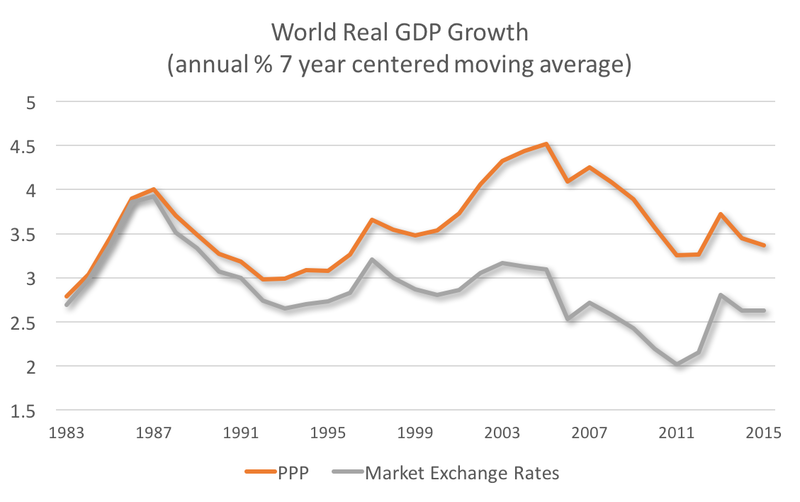 Below I plot world real GDP growth rates (smoothed by taking a 7-year centered average) measured at market exchange rates and PPP (both data are produced by the IMF). During the early 80s both measures were identical because emerging markets did not grow faster than advanced economies (plus their relative size was smaller). Since the 90s the gap opens and reaches a maximum of about 1.5% a year during the mid 2000s, the time when emerging markets were growing at their fastest rate. What do we make of the last decade? Using the PPP yardstick it simply looks like a return to the rates of early decades. The exceptional years where the 2003-2008 period where the world grew above 4%. Rates of 3-3.5% look normal. But using market exchange rates recent data paints a picture of mediocrity (or worse). Rates in the range 2-2.5% are very low by historical standards. The last years feel like the worst years we have since in terms of growth. Which of the two numbers is the right one? The use of PPP is justified when measuring improvements in living standards. The larger weight given to emerging markets makes sense given that the volume of goods and services they produce is larger than what a market exchange rate conversion suggests. But from many other perspectives market exchange rates make more sense: financial flows are aggregated using market exchange rates so from the perspective of financial markets the market exchange rate GDP measure might be more precise. Also from the perspective of a multinational company looking at the world economy as a source of demand market exchange rates are likely to provide a better picture of the state of the world. It is therefore not surprising that when we look at the state of the world economy what looks like returning to earlier growth rates for some might look like mediocre (or even pathetic) growth for others. Make sure you read the footnote before you check the next chart on the state of the world economy. While the ECB and Bank of Japan are exploring negative interest rates, the US Federal Reserve is preparing us for a slow and cautious increase in short-term interest rates. Long-term rates remain at very low levels and inflation expectations have come under pressure and also remain below what they were a few months or years ago. And as this is going on markets are trying to figure out if they like low or high interest rates. And even if they decide that they like low rates, are negative rates too low? In all these debates there seems to be an unusual amount of what economists call money illusion or lack of understanding of the difference between nominal and real interest rates. This confusion, in my view, is partly motivated by the communication strategy of central banks that seem to obsess with the asymmetric nature of their inflation targets (for both the ECB and US Fed, inflation targets are defined as close but below 2%) and are not clear enough on their final goal and its timing. How do we want interest rates to react to aggressive monetary policy? The common answer is that we want interest rates to go down. This is correct if we think in real terms: given inflation expectations (or actual inflation), we want interest rates to move down relative to those inflation levels. 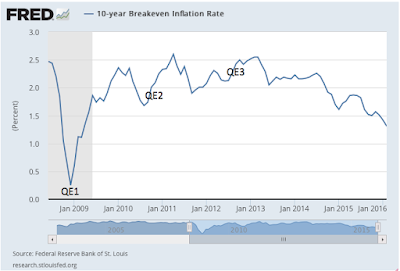 But in some cases, in particular when inflation expectations are lower than what central banks would like them to be, the central bank by being aggressive is targeting higher inflation expectations and this can possibly lead to higher nominal (long-term) interest rates. This is what happened in the three rounds of quantitative easing by the US Federal Reserve. 10-Year interest rates went up which was a signal of increasing inflation expectations (and even higher expectations of future real interest rates). This was seen as a success. But the behavior of long-term interest rates or inflation expectations in response to recent communications by central banks has gone in the opposite direction. Long-term rates have come down (in particular in the Euro area). But don't we want lower interest rates? Isn't this the objective of massive purchases of long-term assets by central banks? Yes if we talk about real interest rates but not obvious if we talk about nominal ones. What we really want is inflation expectations (and inflation) to increase and this is likely to keep long-term interest rates from falling so much. And here is where I feel the central banks are not helping themselves. There are two mistakes they are doing: in their messages about interest rates they do not distinguish clearly between nominal and real interest rates. What I want to do is to send a message that real interest rates will remain low for an extended period of time to ensure higher inflation ahead and to ensure that nominal interest rates increase in the future so that we can escape the zero lower bound. 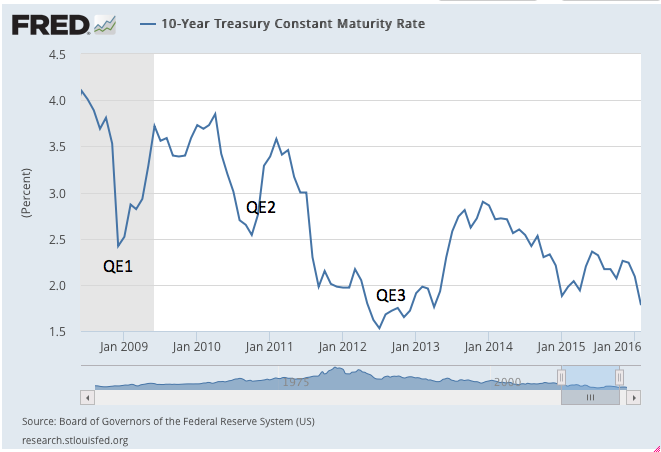 By talking only about nominal interest rates central banks are sending a signal that we will be stuck at the zero lower bound for a long time, a message that seems to be an admission of defeat. They cannot get out of this trap. And this leads me to the second mistake of central banks: their asymmetric view of their inflation target. In the US, inflation and core inflation is slowly moving towards the 2% target. This is seen by some as a proof that the zero lower bound or the deflation trap has been defeated. But this is the wrong reading. 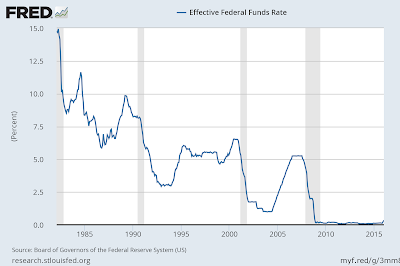 The fact that the federal funds rate remains so close to 0% means that we are still at the zero lower bound or close enough to it and we should not be complacent with what we achieved. 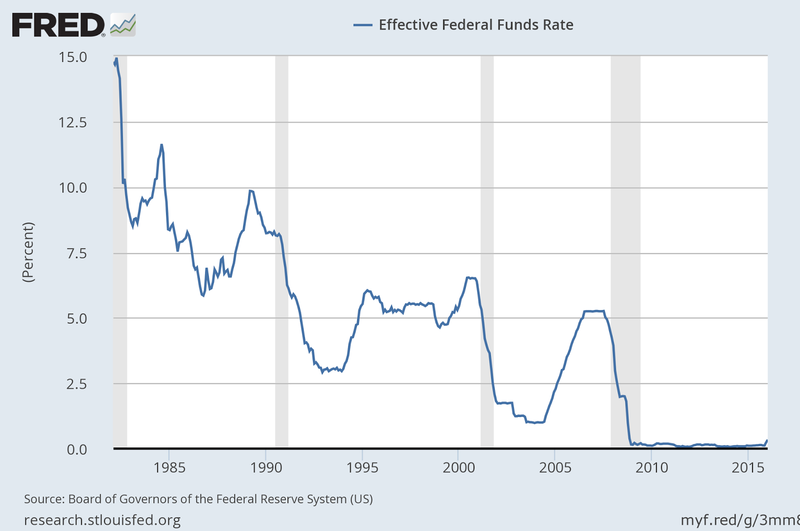 The US Federal Reserve should only call it a success when the federal funds rate is back to 3% or higher, safe away from 0%. But to get there we need to shoot for higher inflation, at least temporarily. The same message or even stronger applies to the ECB. In summary, success in escaping the zero lower bound should be judged by how central bank interest rates manage to move away from 0% not by how long they stay at 0%. Central banks are not communicating this clearly because of the fear that this would be interpreted as a message of future tightening of monetary policy. But by doing so they are hurting their ability to escape the deflation/lowflation trap. The ECB just announced a further reduction in interest rates, extended its QE program by increasing the rate at which buys assets, beefed up the TLTRO program and extended its horizon. It all sounds like good news and many of these actions had been expected in the last meeting of 2015 and they did not happen. Markets reacted very positively on announcement but later, after the press conference, they went down to levels that were significantly below where they were before the announcement. It is always hard to comment on why markets react in a certain way to monetary policy announcements but I must say that watching the press conference I learned about the state of desperation and possibly confusion of the ECB, which was not very reassuring. It might not be their fault, this is life when central banks hit the zero lower bound on interest rates and there is very little they can do. And the available tools are not easy to communicate to markets and the general public. An extra 20 billion for QE, including corporate bonds, loans to banks that have an interest rate contingent on the amount of net lending are all policies that are much harder to understand and calibrate (even for economists) than a reduction in interest rates. So what did we learn yesterday? That the ECB wants to do more but that there is no magical tool that will get the Euro area out of where it is. That the ECB is willing to do more, despite some of the internal resistance, is good news. But the message (explicit and implicit) that they have clearly reached their limit is bad news. From the press conference it was clear that interest rates cannot go down any further. And when it comes to QE there is always room for enlarging the set of assets that are included in the program but the Bank of Japan has tried that for a while without great success. In summary, the zero lower bound trap is a real one. In the absence of aggressive fiscal policy or a sudden and large improvement in the world economy, the ECB is going to have a hard time reaching its inflation target or helping the Euro zone economy return to normal growth rates. Whatever it takes to fix this does not seem part of the tools that the ECB has at its disposal. And I do not want to think about what future ECB press conferences are going to look like. If the US or the Eurozone entered a recession this year, a few macroeconomic variables would look very different relative to previous recessions. 1. The Yield curve would be very steep. 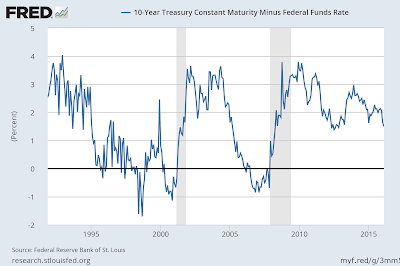 Unlike in any previous recession when the yield curve was flat or inverted. 2. 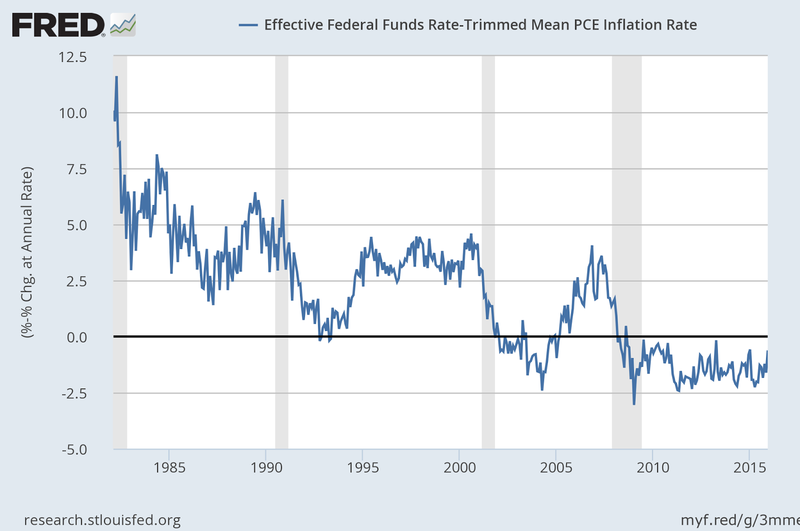 The real federal funds rate (or the ECB real repo rate) would be extremely low and would be at a level similar to that of the beginning of the expansion. Unlike in previous recessions where the real central bank interest rates was high relative to the beginning of the expansion. 3. And nominal central bank interest rates would be stuck at zero so there will be no room to lower them in response to the recession. Unlike in previous recessions where nominal interest rates came down by about 4-7 percentage point (this is also true for real interest rates, see previous chart). So maybe this tells us that a recession is not about to happen. But if it is, the lack of space to implement traditional monetary policy tools should be a big concern for policy makers. If a recession ends up happening, helicopter money will likely become a policy option. 1. Inflation is a global phenomenon, not a national one. Monetary policy has very little influence on inflation, demographics and globalization are much more relevant factors. 2. The idea that monetary policy affects demand and possibly inflation is a "short-term" story that is too simple to understand the recent behavior of inflation. 3. Deflation is not that bad. The Great Depression is a special historical event that holds no lessons for what we have witnessed during the Great Recession. 4. While central banks are powerless at controlling domestic inflation, they are very powerful at distorting interest rates and rates of returns for long periods of time (decades). 5. Central banks have a problem when inflation is the only goal (they end up creating distortions in financial markets). 6. Monetary policy is a cause of all China's problems (he admits that there are other causes as well). In summary, central banks are evil. Their only goal is to control inflation but they cannot really control it and because of their superpowers to distort all interest rates they only end up causing volatility and crises. And this is coming from an organization whose members are central banks and its mission is "to serve central banks". Surreal.